Most systematic reviews are conducted for a practical purpose: to support clinicians, patients, and policy makers—decision makers—in making informed decisions. To make informed decisions about medical tests, whether diagnostic, prognostic or those used to monitor the course of disease or treatment, decision makers need to understand whether a test is worthwhile in a specific context. For example, decision makers need to understand whether a medical test has been studied in patients and care settings similar to those in which they are practicing, and whether the test has been used as part of the same care management strategy that they plan to use. They may also want to know whether a test is robust over a wide range of scenarios for use or relevant only to a narrow set of circumstances. Comprehensive information about the general conduct of reviews is available in the AHRQ Evidence-based Practice Center Methods Guide for Comparative Effectiveness Reviews.2 In this report we highlight common challenges in reviews of medical tests and suggest strategies that enhance interpretation of applicability. Key questions guide the presentation, analysis, and synthesis of data, and thus the ability to judge applicability. Key questions should provide a clear context for determining the applicability of a study. Lack of specificity in key questions can result in reviews of larger scope than necessary, failure to abstract relevant study features for evidence tables, less useful organization of summary tables, disorganized synthesis of results, and findings from meta-analysis that do not aggregate data in crucial groupings. In addition, key questions that do not distinguish the management context in which the test is being used can introduce misinterpretations of the literature. A common scenario for such confusion is when the research compares the accuarcy of a new test to another test (i.e., as a replacement), but in reality, the test is proposed to be used as a triage test to guide further testing or as an add-on after another test. If relevant contextual factors are not stipulated in the key questions, it also hinders decisions during the review process. Which studies should be included and which excluded? If the patient population and care setting are not explicitly described, the default can be to broadly lump all contexts and uses of the test together. However, decisions to “lump” or “split” must be carefully considered and justified. Inappropriate lumping without careful consideration of subgroups that should be analyzed separately may result in oversimplification. Decisions about meaningful subgroupings, for instance by age of participants, by setting (hopsital versus ambulatory), or version of the test, should be made in advance. Conducting subgroup analyses after appraising the included studies may introduce type 1 error from a posteriori biases in interpretation, making it difficult to distinguish whether identified effects are spurious or real. Decisions in advance to split reporting of results for specific subgroups and contexts should be carefully considered and justified. Decisions should be based on whether there is evidence that a particular contextual factor is expected to influence the performance characteristics of the test or its effectiveness as a componenet of care. When there is appropriate justification to “split” a review so that key questions or subquestions relate to a specific population, setting, or management strategy, the studies identified for inclusion may not reflect the same subgroups or comparisons identified in the key questions. The reviewer is faced with deciding when these deviations from ideal are minor, and when they are more crucial and are likely to affect test performance, clinical decision-making, and health outcomes in some significant way. The conduct and synthesis of the findings will require a method to track and describe how the reviewers dealt with two types of mismatches: (1) literature from other populations and contexts that does not directly address the intended context of the key question; and (2) studies that do not provide sufficient information about context to determine if they apply. Annotation througout the review, in tables and synthesis, can then note if these types of mismatch apply, how common they were, and what the expected impact is on interpreting applicability. A third challenge, especially relevant to medical tests, is that, even more than treatments, tests often change rapidly, in degree (enhancements in existing technologies), type (substantively new technologies), or target (new molecular targets). The literature often contains evidence about tests that are not yet broadly available or are no longer common in clinical use. Secular trends in use patterns and market forces may shape applicability in unanticipated ways. For instance, suppose that a test is represented in the literature by dozens of studies that report on a version that provides dichotomous, qualitative results (present versus absent), and that the company marketing the test subsequently announces production of a new version that provides only a continuous, quantitative measure. Or genetic tests for traits may evolve from testing for a single-nucleotide polymorphisms to determining the gene sequence. In these situations, reviewers must weigh how best to capture data relating the two versions of the test and decide whether there is value in reviewing the obsolete test to provide a point of reference for expectations about whether the replacement test has any merit or whether reviewing only the more limited, newer data better addresses the key question for contemporary practice. In an ideal review, all possible factors related to the impact of a test use on health outcomes should be considered. However, this is usually not practical, and some tractable list of factors must be considered before initiating a detailed review. Consider factors that could affect the causal chain of direct relevance to the key question: for instance, in assessing the accuracy of cardiac MRI for detecting atherosclerosis, slice thickness is a relevant factor in assessing applicability. It is also important to consider applicability factors that could affect a later link in the causal chain (e.g., for lesions identified by cardiac MRI vs. angiogram, what factors may impact the effectiveness of treatment?). The severity or type of disease may effect the accuracy of the test. For example, cardiac MRI tests may be generally accurate at identifying cardiac anatomy and functionality, but certain factors may affect the test performance, such as arrythmias, location of the lesion, or obesity. Reviews must identify these factors ahead of time and justify when to “split” questions or to conduct sub-group analyses. Studies on cardiac MRI often select patients with a relatively high pre-test probability of disease (i.e., presumably pre-screened with other non-invasive testing such as stess EKG) and evaluate the diagnostic accuracy when compared to a gold standard of x-ray coronary angiography. However, the test performance under these conditions does not necessarily apply when used in patients with lower pre-test probability of disease, such as when screening patients with no symptoms or when used as an initial triage test (i.e., compared to stress EKG) rather than an add-on test after initial screening. It is important for reviewers to clarify and distinguish the conditions in which the test is studied and in which it is likely to be used. Diagnostics, like all technology, evolve rapidly. For example, MRI slice thickness has fallen steadily over time, allowing resolution of smaller lesions. Thus, excluding studies with older technologies and presenting results of included studies by slice thickness may both be appropriate. Similarly, antenatal medical tests are being applied earlier and earlier in gestation, and studies of test performance would need to be examined by varied cutoffs for stages of gestation, and genetic tests are evolving from detection of specific polymorphisms to full gene sequences. Awareness of these changes should guide review parameters such as date range selection and eligible test type for the included literature to help categorize findings and discussion of results. Direct and indirect changes in the secular setting (or differences across cultures) can influence medical test performance and applicability of related literature. As an example, when examining the value of screening tests for gestational diabetes, test performance is likely to be affected by the average age of pregnant women, which has risen by more than a decade over the past 30 years, and by the proportion of the young female population that is obese, which has also risen steadily. Both conditions are associated with risk of type II diabetes. As a result, we would expect the underlying prevalence of undiagnosed type II diabetes in pregnancy to be increased, and the predictive values and cost-benefit ratios of testing, and even the sensitivity and specificity in general use, to change modestly over time. Secular trends in population characteristics can have indirect effects on applicability when population characteristics change in ways that influence ability to conduct the test. For example, obesity diminishes image quality in tests, such as ultrasound for diagnosis of gallbladder disease or fetal anatomic survey, and MRI for detection of spinal conditions or joint disease. Since studies of these tests often restrict enrollment to persons with normal body habitus, current population trends in obesity mean that such studies exclude an ever-increasing portion of the population. As a result, clinical imaging experts are concerned that these tests may not perform in practice as described in the literature because the actual patient population is significantly more likely to be obese than the study populations. Expert guidance can identify such factors to be considered. Prevalence is inexorably tied to disease definitions that may also change over time. Examples include: (1) criteria to diagnose acquired immune deficiency syndrome (AIDS), (2) the transition from cystometrically defined detrusor instability or overactivity to the symptom complex “overactive bladder,” and (3) the continuous refinement of classifications of mental health conditions recorded in the Diagnostic and Statistical Manual updates.5 If the diagnostic criteria for the condition change, the literature may not always capture such information; thus, expert knowledge with a historical vantage point can be invaluable. Routine use of a medical test as a screening test might be considered an indirect factor that alters population prevalence. As lipid testing moved into preventive care, the proportion of individuals with cardiovascular disease available to be diagnosed for the first time with dyslipidemia and eligible to have the course of disease altered by that diagnosis has changed. New vaccines, such as the human papilloma virus (HPV) vaccine to prevent cervical cancer, are postulated to change the distribution of viral subtypes in the population and may influence the relative prevalence of subtypes circulating in the population. As preventive practices influence the natural history of disease, such as increasing proportions of a population receiving vaccine, they also change the utility of a medical test, like that for HPV detection. Knowledge of preventive care trends is an important component of understanding current practice to consider as a backdrop when contextualizing the applicability of a body of literature. As therapeutics arise that change the course of disease and modify outcomes, literature about the impact of diagnostic tools on outcomes requires additional interpretation. For example, the implications of testing for carotid arterial stenosis are likely changing as treatment of hypertension and the use of lipid-lowering agents have improved. We suggest two steps to ensure that data about populations and subgroups are uniformly collected and useful. First, refer to the PICOTS typology3,4 (see Table 1) to identify the range of possible factors that might affect applicability and consider the hidden sources of limitations noted above. Second, review the list of applicability factors with stakeholders to ensure common vantage points and identify any hidden factors specific to the test or history of its development that may influence applicability. Features judged by stakeholders to be crucial to assessing applicability can then be captured, prioritized, and synthesized in the process of designing the process and abstracting data for an evidence review. Despite best efforts, some contextual factors relevant to applicability may only be uncovered after a substantial volume of literature has been reviewed. For example, in a meta-analysis, it may appear that a test is particularly inaccurate for older patients, although age was never considered explicitly in the key questions or in preparatory discussions with an advisory committee. It is crucial to recognize that like any relationship discovered a posteriori, this may reflect a spurious association. In some cases, failing to consider a particular factor may have been an oversight; in retrospect, the importance of that factor on the applicability of test results may be physiologically sensible and supported in the published literature. Although it may be helpful to revisit the issue with an advisory committee, when in doubt, it is appropriate to comment on an apparent association and clearly state that it is a hypothesis, not a finding. In general, it may be appropriate to restrict a review to specific versions of the test, selected study methods or types, or populations most likely to be applicable to the group(s) whose care is the target of the review such as a specific group (e.g., people with arthritis, women, obese patients) or setting (e.g., primary care practice, physical therapy clinics, tertiary care neonatal intensive care units). These restrictions may be appropriate (1) when all partners are clear that a top priority of a review is applicability to a particular target group or setting, (2) when there is evidence that test performance in a specific subgroup differs from the test performance in the broader population or setting or that a particular version of the test performs differently than the current commonly used version. Restriction of reviews is efficient when all partners are clear that a top priority of a review is applicability to a particular target group or setting. Restriction can be more difficult to accomplish when parties differ with respect to the value they place on less applicable but nonetheless available evidence. Finally, restriction is not appropriate when fully comprehensive summaries including robust review of limitations of extant literature are desired. Depending on the intent of the review, restricting the review during the planning process to include only specific versions of the test, selected study methods or types, or populations most likely to be applicable to the group(s) whose care is the target of the review may be warranted. For instance, if the goal of a review is to understand the risks and benefits of colposcopy and cervical biopsies in teenagers, the portion of the review that summarizes the accuracy of cervical biopsies for detecting dysplasia might be restricted to studies that are about teens; that present results stratified by age; or that include teens, test for interaction with age, and find no effect. Alternatively, the larger literature could be reviewed with careful attention to biologic and health systems factors that may influence applicability to young women. In practice, we often use a combination of inclusion and exclusion criteria based on consensus along with careful efforts to highlight determinants of applicability in the synthesis and discussion. Decisions about the intended approach to the use of literature that is not directly applicable need to be tackled early to ensure uniformity in review methods and efficiency of the review process. Overall, the goal is to make consideration of applicability a prospective process that is attended to throughout the review and not a matter for post hoc evaluation. As a general principle, reviewers should address applicability as they define their review methods and document their decisions in a protocol. For example, time-varying factors should prompt consideration of using timeframes as criteria for inclusion or careful descriptions and analyses as approprite of the possible impact of thes effects on applicability. Transparency is essential, particularly when a review decision may be controversial. For example, after developing clear exclusion criteria based on applicability, a reviewer may find themselves “empty-handed.” In retrospect, experts—even those accepting the original exclusion criteria—may decide that some excluded evidence may indeed be relevant by extension or analogy. In this event, it may be appropriate to include and comment on this material, clearly documenting how it may not be directly applicable to key questions, but represents the limited state of the science. Our work on the 2002 Cervical Cancer Screening Summary of the Evidence for the US Preventive Services Task Force6 illustrates several challenges and principles at work: the literature included many studies that did not use gold standards or testing of normals, and many did not relate cytologic results to final histopathologic status. We encountered significant examples of changes in secular trends and availability and format of medical tests: liquid-based cervical cytology was making rapid inroads into practice; resources for reviewing conventional Pap smear testing were under strain from a shortage of cytotechnologists in the workforce and from restrictions on the volume of slides they could read each day; several new technologies had entered the market designed to use computer systems to pre- or postscreen cervical cytology slides to enhance accuracy; and the literature was beginning to include prospective studies of adjunct use of HPV testing to enhance accuracy or to triage which indiviudals needed evaluation with colposcopy and biopsies to evaluate for cervical dysplasia and cancer. No randomized controlled trials (RCTs) were available using, comparing, or adding new tests or technologies to prior conventional care. Because no data were available comparing the effects of new screening tools or strategies on cervical cancer outcomes, the report focused on medical test characteristics (sensitivity, specificity, predictive values, and likelihood ratios), reviewing three computer technologies, two liquid cytology approaches, and all methods of HPV testing. Restricting the review to techologies available in the United States, and therefore most applicable, would have reduced the scope substantially. Including all the technologies to determine if there were clear differences among techniques made clear whether potentially comparable or superior methods were being overlooked or no longer offered, but may have also unnecessarily complicated the findings. Only in retrospect, after the decision to include all tests was made and the review conducted, were we able to see that this approach did not substantially add to understanding the findings because the tests that were no longer available were not meaningfully superior. Although clearly describing the dearth of information available to inform decisions, the review was not able to provide needed information. As a means of remediation, not planned in advance, we used prior USPSTF meta-analysis data on conventional Pap medical test performance7, along with the one included paper about liquid cytology8, to illustrate the potential risk of liquid cytology overburdening care systems with detection of low-grade dysplasia while not substantively enhancing detection of severe disease or cancer.9 The projections from the report have since been validated in prospective studies. For two specific areas of applicability interest (younger and older age, and hysterectomy status), we included information about underlying incidence and prevalence in order to provide context, as well as to inform modeling efforts to estimate the impact of testing. These data helped improve understanding the burden of disease in the subgroups compared with other groups, and improve understanding about the yield and costs of screening in the subgroups compared with others. Review teams need to familiarize themselves with the availability, technology, and contemporary clinical use of the test they are reviewing. They should consider current treatment modalities for the related disease condition, the potential interplay of the disease severity and performance characteristics of the test, and the implications of particular study designs and sampling strategies for bias in the findings about applicability. As examples throughout this report highlight, applicability of a report can be well served by restricting inclusion of marginally related or outdated studies. Applicability is rarely enhanced by uncritically extrapolating results from one context to another. For example, we could not estimate the clinical usefulness of HPV testing among older women from trends among younger women. In the design and scoping phase for a review, consideration of the risks and advantages of restricting the scope or excluding publications with specific types of flaws, benefits from explicit guidance from clinical, medical testing, and statistical experts about applicability challenges. Often the target of interest is intentionally large—for example, all patients within a health system, a payer group such as Medicare, or a care setting such as a primary care practice. Regardless of the path taken—exhaustive or narrow—the review team must take care to group findings in meaningful ways. For medical tests, this means gathering and synthesizing data in ways that enhance ability to readily understand applicability. Grouping summaries of the findings using familiar structures like PICOTS can enhance how clearly the applicability issues are framed, for instance grouping results by the demographics of the population included: all women, women and men, by the intervention, grouping together studies that used the same version of the test, or by outcomes, grouping together those studies that report an intermediate marker versus those that measured the actual outcome of interest. This may mean that studies are presented within the review more than once, grouping findings along different “applicability axes” to provide the clearest possible picture. Since most systematic reviews are conducted for the practical purpose of supporting informed decisions and optimal care, keeping applicability in mind from start to finish is an investment bound to pay off in the form of a more useful review. The principles summarized in this review can assure valuable aspects of weighing applicability are not overlooked and that review efforts support evidence-based practice. Early in the review planning process, systematic reviewers should identify important contextual factors that may affect test performance (Table 1). • Improved outcomes, quality of life, costs, etc. Reviewers should carefully consider and document justification for how these factors will be addressed in the review—whether through restricting key questions or from careful assessment, grouping, and description of studies in a broader review. ○ A protocol should clearly document which populations or contexts will be excluded from the review and how the review will assess subgroups. ○ Reviewers should document how they will address challenges in including studies that may only partly fit with the key questions or inclusion/exclusion criteria, or that poorly specify the context. The final systematic review should include a description of the test’s use in usual practice and care management and how the studies fit with the usual practice. 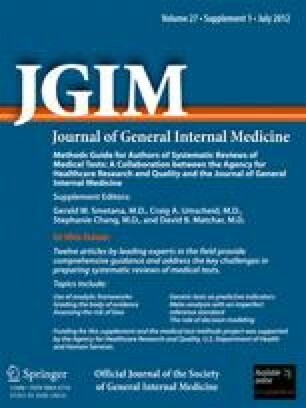 This paper is based on the experiences of the EPC program in conducting systematic reviews of medical tests and on the proceedings of a working meeting held at AHRQ in 2008 (white papers published here and in MDM: http://www.effectivehealthcare.ahrq.gov/index.cfm/search-for-guides-reviews-and-reports/?pageaction=displayProduct&productID=350). We are grateful to our many peers across the AHRQ and EPC leadership who have sustained conversations about best practices and have continually advanced the methods for review of medical tests and their applicability. This project was funded under contract no. 290-2007-10065-I and 290-2007-10066-I from the Agency for Healthcare Research and Quality, US Department of Health and Human Services. Statements in the report should not be construed as endorsement by the Agency for Healthcare Research and Quality or the US Department of Health and Human Services. Agency for Healthcare Research and Quality (US). Methods guide for medical test reviews. Available at: http://www.effectivehealthcare.ahrq.gov/tasks/sites/ehc/assets/File/methods_guide_for_medical_tests.pdf. Accessed November 8, 2011. Agency for Healthcare and Research Quality (US). Methods reference guide for effectiveness and comparative effectiveness reviews. Available at: http://effectivehealthcare.ahrq.gov/index.cfm/search-for-guides-reviews-and-reports/?pageaction=displayProduct&productID=318. Accessed November 8, 2011. Matcher DB. Introduction to the Methods Guide for Medical Test Reviews. J Gen Intern Med. 2011; doi: 10.1007/s11606-011-1798-2. Samson D. Schoelles KM. Chapter 2: Medical Tests Guidance (2) Developing the Topic and Structuring Systematic Reviews of Medical Tests: Utility of PICOTS, Analytic Frameworks, Decision Trees, and Other Frameworks. J Gen Intern Med. 2012; doi: 10.1007/s11606-012-2007-7. Hartmann KE, Hall SA, Nanda K, Boggess JF, Zolnoun D. Screening for cervical cancer. Available at: http://www.ahrq.gov/downloads/pub/prevent/pdfser/cervcanser.pdf. Accessed November 8, 2011.